My name is Okey Eweani. I am from Enugu-Agidi in Anambra State, Nigeria. I was born in Jos, Plateau State in 1958. 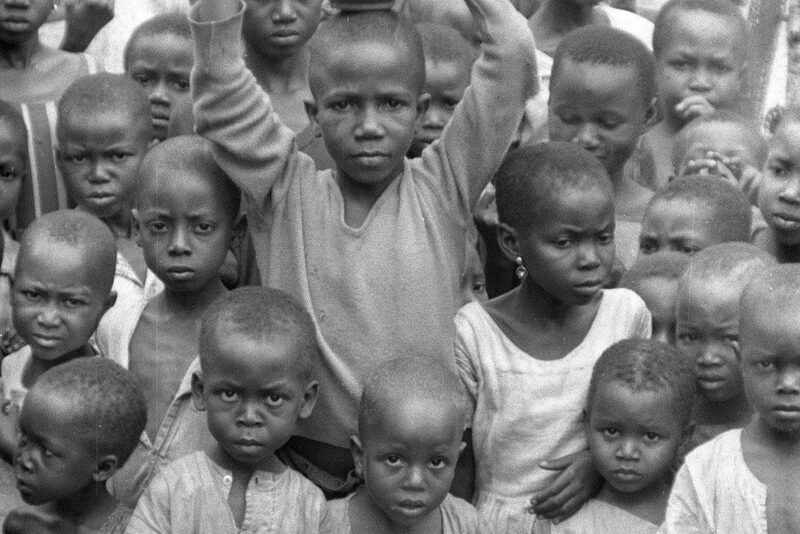 What comes to my mind [about the war] was the suffering and the atrocities, the diseases that was rampant at the time like kwashiorkor and also the suffering of kids and everything. Bombardment. During the war I was 10 years old. When the war came down to the east I was 10 years old at the time 1968, so basically the role I played was running with my family. We were carrying our belongings. We went from Enugu-Agidi to Okwulu. Okwulu is a town that is approximately a ten minutes drive from Enugu-Agidi. That is where we resettled. We resettled at Okwulu for a couple of months before the Nigerian soldiers came close to Okwulu. Then we ran from Okwulu to Umunze. In Okwulu, we were staying in a compound that contained so many refugees. You know people running from the war from different villages. All of us were in the same compound at the time. I remember that vividly. It was like on a constant basis we heard sirens, air raid sirens and people were running helter skelter trying to find shelter somewhere to hide. And we see the aircrafts overhead most of the time. Fortunately, we did not have to hide in the bushes though most of the villages at the time were almost like bushes also. My uncle, actually went to the army. He fought in Otuocha. Otuoche is in the new Anambra state now. He fought in Otuocha. They were also responsible for the liberation of Otuocha from the Nigerian troops at the time. I also lost one of my other uncles in the war. I lost him at Abagana sector. So many people were killed at the time. I was not afraid of being conscripted at the time because I was ten years at the time. Even though at the time they were looking for anybody they can find to put in the Army or the Boys’ Brigade. One of my sisters contracted kwashiorkor and she died during the war also. We lived in a refugee camp at Umunze. We lived there for a couple of weeks until after they started distributing the relief materials. They distributed alikama. There is one relief material called alikama at the time. People were hustling for it. Alikama. It is a wheat, it is like a barley. It is a wheat cereal. Because at that time kwashiorkor was very rampant due to starvation. This was in 1969. I remember vividly, around that April 1969. I was skinny at the time. Fortunately I never contracted kwashiorkor. But one of my sisters did. One of my sisters contracted kwashiorkor and she died during the war also. My sister from my father’s second wife. Yeah we watched her die; it was terrible. It was a sad story, very very sad. At the time she was 8 years old. It was a very slow death. We used to force her to eat vegetables. We gave vegetables for her to eat but she refused to eat and at the time it was too late. It was a very painful experience. Her name was Dorothy. I remember vividly. Her name was Dorothy. I miss her as a playmate at the time. I really do miss her. She was quiet and she was very quiet. She was a quiet child. But she is very playful also. She was very playful also. Everybody was not happy. Everybody was not happy at all. It was very gloomy. A lot of crying. A lot of crying. She died at home [not in the refugee camp]. At that time when she died we were already in Aba because we moved from Umunze to Aba. So she died in our house in Aba at the time. [Because] we went back to Aba. We buried her in Aba also. Our only personal loss again is my other uncle, Nwibe. That one died in Jos. He died in Jos in the process of running from the genocide because at the time there were just doing selective killing of our people, that one was 1967, I believe. That was before the war started in full swing. That was the beginning of the war. His English name is Willy, Willifred. We didn’t saw his body. We never saw his body. The family at the time; the suffering was intense, but of course my father was a very resilient person so he was able to provide for the family. He used to travel to where they call Biafra One. Biafra One is an exclusive area around Aba where they go to buy things that they will come back and sell. So he was able to provide for the family at the time. But it was not easy for the other families. He gets the money from trading, because at the time we were also running a small mama put restaurant at Aba called Universal Hotel at Number 101 Hospital Road as I remember vividly. 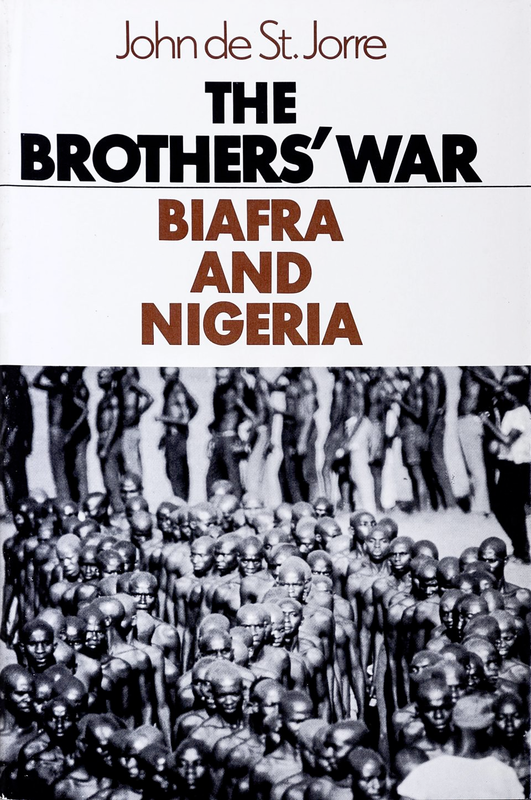 It was Biafran soldiers because that time Aba was being occupied by Biafran soldiers. Stories [of girls being raped] were rampant at the time but I never saw one. But I know it was rampant. They used to collect our ladies, our Igbo ladies, and then just disappear. You will not see them again. But at the end of the war we started seeing some of them at the end of the war. Some of them started coming back to the village at the end of the war. They were already married to those Nigerian soldiers. One of my nieces is an example. She married to a guy from Benue from Makurdi. I am sorry from Gboko, Benue state. I saw dead bodies when we were running from Ukwulu. When were running from Okwulu we saw dead bodies. Our father saw a lady hit by a shell and she fell. She died from a shell from a gunshot. I think it was a stray bullet, I don’t know if it was a stray bullet or from the shooting. But of course, she was bleeding. Nobody could turn around to help. Because everybody was fighting for their lives. I wanted to [go back and help her] but I was too young. My family, all of them, nobody was willing to stop because everybody was running for their lives.I was very, very scared. Like I said I was too young at the time. You know kids are not too fearful like that. But it was a terrible experience. I also saw a dead body in one of the kitchens in a compound we were staying in Aba. The dead body was like on a smoke stack. I don’t know why but after we discovered that that was the day we left that place. 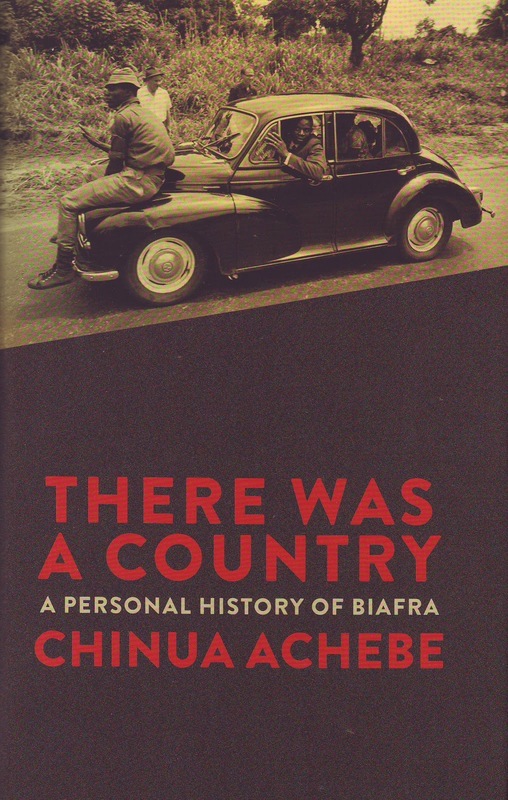 The only think that I understood [at the time] is that the Igbos wanted to go their separate ways due to the injustice that they were being meted out. That was what they were saying at the time. I cannot make any meaning to it at that time anyway. One of the ones [war propaganda songs] I remember is Ikemba, Ikemba, Ikemba, Ikemba, that one. I remember that one. I know the war ended in 1970 but I don’t know the exact date. We started seeing people saying that the war have ended that everybody should be going back to their villages. So that was what I remember. But I know it ended in 1970, the exact date I don’t know. Everybody was jubilating. I was very happy too. I was very happy too. We had seen air raids hitting marketplaces around Abagana. During the time Abagana was being liberated and I was leaving and we saw market places in Abagana close to Oye Agu. They [the marketplace] were hit by air raids. Abagana was being liberated by the Federal troops. The Nigerian troops were taking over Abagana then at the time. So many kilings there, so many. At the time I did [think I was going to die]. At the time I thought we may not make it. We might not make it through the war. [But], you know we played with other kids in the neighborhood when we were living in Aba for example. We played with other kids from other families. We ate lizards. We ate grasshoppers. Even after the war we were eating lizards. It’s a source of meat at the time. After the war, in 1970 when the war ended. 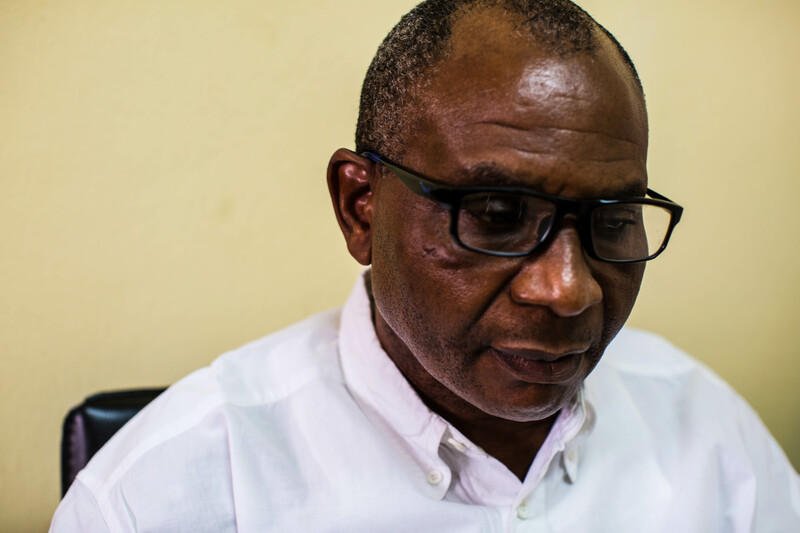 I never did [join my father to Biafra One]. I was too young. It was mainly older people that were doing it. They were calling it something like black market. It was black marketing they were doing at the time. There was no way to think about school at the time. We were only thinking about survival at that time. I got sick so many times. 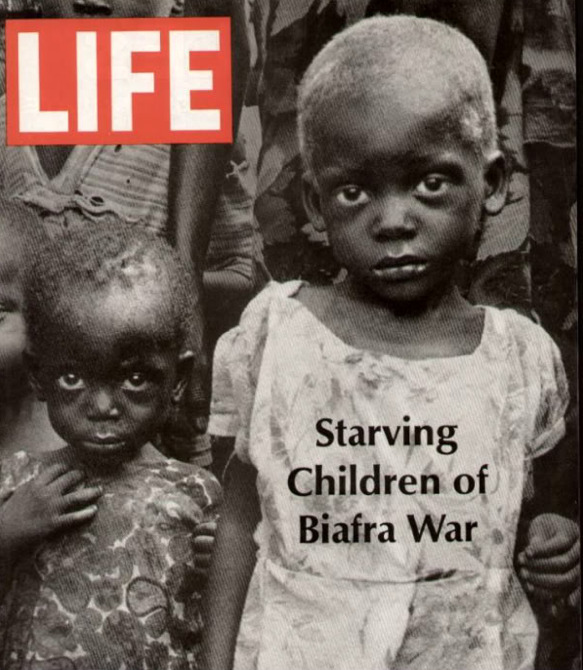 Fortunately none of those illnesses were kwashiorkor because kwarshiorkor was prevalent at the time. At the time it was 8 siblings at the time. I remember. You know there are so many memories to tell but some of the ones I remember, some of these ones I am just telling you. The most powerful memory I remembered is the one I just told you about seeing the body in a smoke stack in one of the compounds that we lived at the time in Aba. Like smoked meat. It was actually a human body. Obviously [for] somebody to have a human body in a smoke stand [means] maybe they were eating it. But we did not eat. We were not cannibalistic. Maybe somebody in that compound was [eating the body]. But we moved from that day. As soon as we saw we moved from that compound that day because it was very scary. Very, very scary. [My family didn’t feel very comfortable with it.] It was a half body- the legs and the torso and the chest. A smoke stack is like if you come to a kitchen where they make fire or firewood, they have a stack up from the kitchen so the smoke that is coming out from the fire will be heating the meat that they hung on that stack. So it is sort of like help the meat to smoke. Sort of smoking the meat in other words. [This was not someone who was shot by a shell and fell in the smoke stack. This was somebody who] was place there. The body was placed there [ for consumption] or parts of the body was placed there. That is the most powerful memory I remember. At that time I didn’t know [the difference between Hausa and Igbo] but I know that the war was between the Hausas and the Igbos. I know that the war is between both of them but I didn’t know the difference. I know we were all one Nigeria before the war started. Before the war we were living in Jos. We had to flee Jos to the village. We went on a train to Enugu. Then from Enugu we used a loaded lorry to get to the village. So many people in the lorry also. There was a lot of commotion a lot of fear, a lot of killings too. I knew my father stayed back when we left Jos. He stayed back and later came down to join us. Not with my eye I did not [see anyone killing] but we heard about it. It was at night, it was at night [that we left for the train]. We saw some people that covered themselves, dressed like Muslims, trying to escape. Elderly adults, people in their forties or mid-thirties trying to run. They were disguising themselves. One of my uncles did that for sure. My father did that also. He dressed like a Muslim man when he came back to the east. He came back much later after we left. He was wearing this their long robes and he used their hat and that shield that they put, like a scarf. [Being] in a train it was exciting. As a kid, you are excited to be in a train but the train was standing room only. So many people in the train. I don’t remember seeing bloody bodies on the train. I don’t remember. But I know that we were very very scared. We were very afraid at the time. The train stopped at Langa Langa, there is a place called Langa Langa. Then it stopped at Otukpo. Before Otukpo, the train also stopped in Makurdi. And from my understanding, they were telling me that some people were pulled off the train at Otukpo. So many of our people perished there also in Otukpo. [My mother] she was very protective of all her kids, not just me. All the siblings, she was protecting all of them. We still go to church during the war. Basically, mostly, we go to prayer houses for prayers. We do that. The older siblings, some of them went to school during the war at Aba. Some of them were schooled at Aba. Even though school was interrupted by constant air raids and all that. 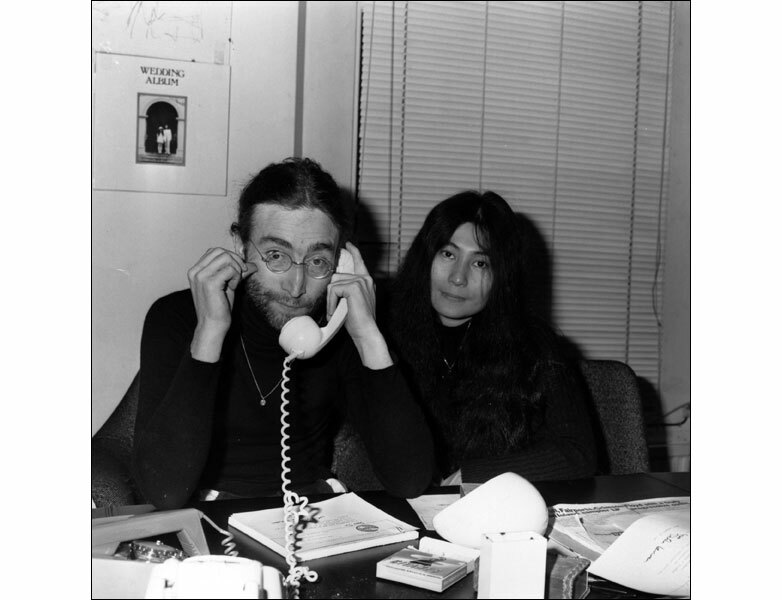 We see the planes overhead and we hear the air raids and some people are running helter and skelter. Fortunately we were not hit. I want to say that war is never good. It was not a good experience. We hope that it will not repeat itself again in Nigeria.